Are you a teacher in Missouri looking for resources to teach Missouri History to your third graders? 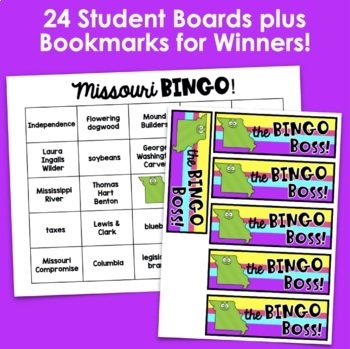 This money-saving bundle includes 14 Missouri History Resources- interactive notebooks covering all of the standards, a bulletin board set, a timeline to display in your classroom, games, a Harry S.
Missouri History Bingo is a fun way to review Missouri History! Students are engaged playing a familiar game with a "Show-Me" State spin. The teacher question calling cards cover a wide range of topics including state history, state symbols, government, and famous Missourians. This resource is low- prep and can be enjoyed again and again! 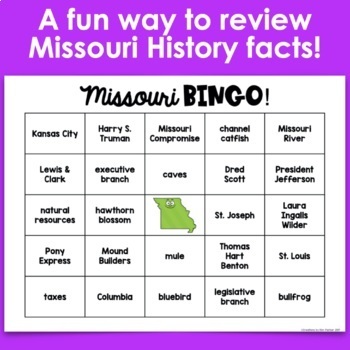 This resource can be purchased in a money saving MISSOURI HISTORY BUNDLE! Be sure to check out the PREVIEW to see a sample of all that is included. 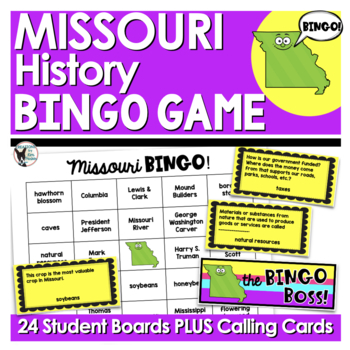 I have several other Missouri History Resources available in my store!